The Malta Council for the Voluntary Sector (MCVS), responsible to organise activities under the VO Fund according to the VO Act (Cap. 492) of the 11th December, 2007, is requesting the Expression of Interest for the Provision of Services by Architects/Civil Engineer. Verify that all structural works are done according to tender requirements and local standards and regulations. All the above mentioned services and facilities should be provided in an itemized manner which shows the whole breakdown of expenses in the submitted expression of interest and including VAT. For more information do not hesitate to send an e-mail to Mr Mauro Pace Parascandalo on (mauro.pace-parascandalo@gov.mt), or by phone on 2248 1110. Organisations or individuals intending to submit a proposal are to send their particulars on (mcvs.msdc@gov.mt) in case any clarifications need to be communicated to all interested bidders. Bidders are to submit one (1) copy of their Expression of Interest for the Provision of Services by Architects/Civil Engineer response clearly marked “Expression of Interest for the Provision of Services by Architects/Civil Engineer”, on the sealed envelope and documents are to be entitled “Expression of Interest for the Provision of Services by Architects/Civil Engineer”.The document for the Expression of Interest can be found from (www.maltacvs. org) under Resources/Documents. An electronic version of the requested information may also be requested and will be forwarded via e-mail. A brief overview of previous related work experience. 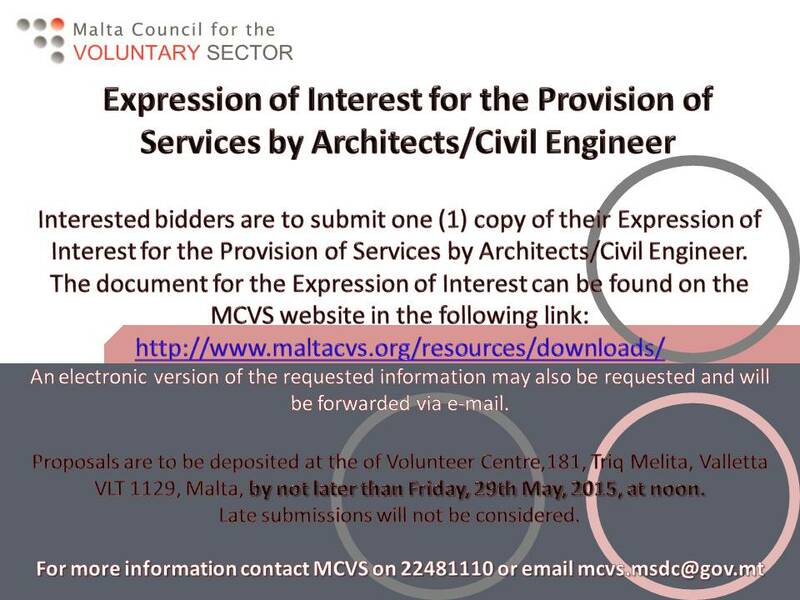 Proposals are to be deposited at the of Volunteer Centre, 181, Triq Melita, Valletta VLT 1129, Malta, by not later than Friday, 29th May, 2015, at noon. Late submissions will not be considered.